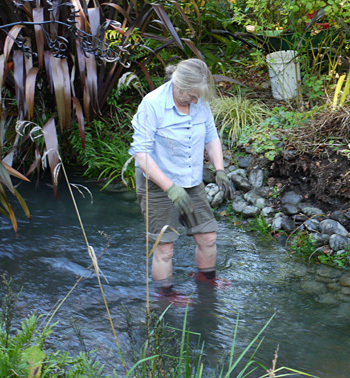 The water comes from the nearby Waimakariri River. It's often quite cold with snow-melt in the spring, and silty when there's rain in the mountains. Only when the river is in serious flood is the water race shut down to a trickle. There has to be enough for any tiny fish (brown trout) to survive. Moosey gardens have developed around the water race, and the banks have been planted mainly with Phormiums, ferns and giant Gunnera. There are four bridges, and waterside paths. All the giant Gunnera are free-floaters, arriving as seedlings from upstream. And the ferns have a habit of spreading and popping up everywhere, too. This flowing water feature is much loved by the Head Gardener - whether seeking ambience with a good book in hand, or wanting to cool off! Dogs and cats drink the refreshing cool water. Summer weeding of the water race banks is very pleasant - standing in the water keeping cool. Mid-winter work was not so nice - until I saw the light and bought some fisherman's waders. The edges of the water race do tend to erode. This is partly caused by the Head Gardener's random weeding frenzies, but also the water flow, which tends to undercut the sides of the race. So I've strengthened some of the edges with stones. I also try to leave larger roots in situ, rather than digging and weakening the soil. So when a Phormium gets too big, it's chopped down to ground level, and is allowed to re-sprout. 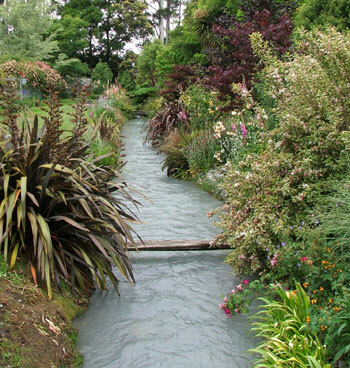 The photographs on this page should show you the variety of water-side plantings on the water race's banks. Enjoy! But beware - the water is icy cold in winter.